It was very well attended, with parents from Ixworth and Great Barton and others present. Despite the attempted intervention of a shouty man, the audience listened intently to the details of the Thurston Partnership plan and many of my own questions were answered. I thought Helen Wilson and Sarah Rees showed an impressive vision of what a two-tier solution could look like in this area. Many people in the hall are still not convinced that the move to two-tier is necessary, but they were presented with an affordable, workable plan. 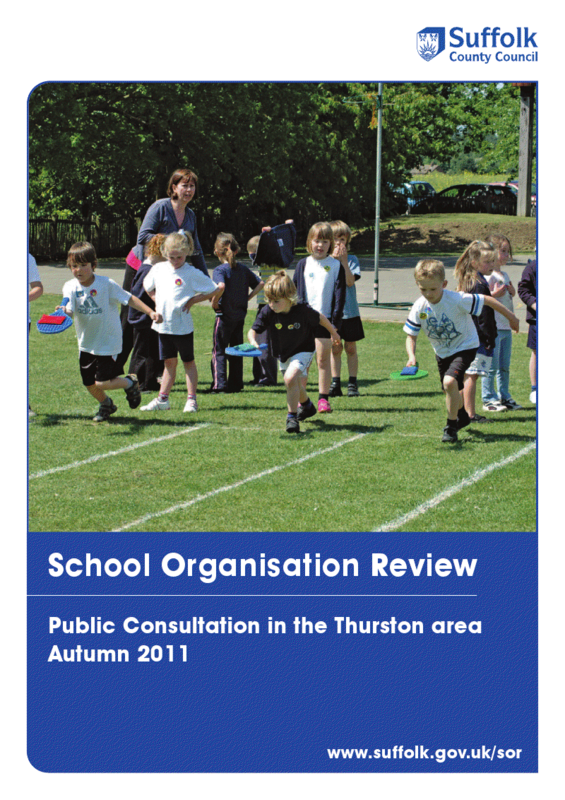 She has also produced a detailed Question and Answer web page about the Thurston Partnership plans that tries to concentrate on the facts of the proposal and answer some of the most frequently asked questions that parents and other might have. It is well worth reading. The full consultation document produced by the County Council is also available. I didn't attend the meeting but what I would say is that there is certainly a clear proposal on the table here that is funded and a lot of thought has gone into it. There are clearly questions as well about aspects of the proposal such as the split site but there was more information at the meeting as to how this could work in practice. 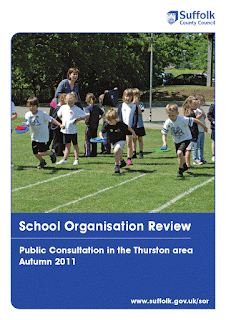 There are difficulties with operating school from two sites, but Thurston has carefully investigated models of split-site school and arrived at a plan that minimises the difficulties. The two sites will operate as one school with one governing body and the same staff. But students will attend one site for five years and there will be two separate cohorts of staff to minimise travelling for everyone. The current staff will be allocated to each site in proportion and new staff recruited to each school to teach the extra children - and some of these staff will be the good and outstanding teachers in the middle schools who are specialists at Key Stage 3. Each site will offer the same broad and balanced curriculum. For some subjects at GCSE, where total numbers of pupils are small, a teacher may need to work across both sites in order to ensure that every student can study the subjects they choose. Extra-curricular options will also be offered to all children with cunning use of the after school buses to transport children between sites at the end of the day if this is necessary. If you want to have your say the consultation is ongoing and the dates of the meetings are shown on p25 of the full consultation document and you can also fill in an online questionnaire. It would be a little unfair to expect the Free School proposals to be at the same stage of planning as the Thurston Partnership plans but they clearly need to do quite a bit more work to explain their proposals in this kind of way. It is clear that the proposals can "co-exist" although the free school plan would impact the Thurston Partnership proposals and in an area where numbers are forecast to fall the affordability of any plans not just to set up but to sustain over the long term must be considered.